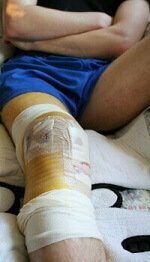 Recovery after ACL surgery is a slow process, taking on average 9-12 months. The outcome is usually extremely positive, ACL reconstruction surgery having a success rate of approximately 90%. However, problems can occur both in the short term and long term. The chances of developing problems are greatly reduced by following a strict rehab programme and having realistic expectations about the recovery process. Problems after ACL surgery are usually minor and short lived, but some people do experience ongoing problems. Here we will look at the most common problems that occur. ACL reconstruction surgery involves replacing the torn anterior cruciate ligament with a new graft. This is taken either from your own tissue (autograft), or from donor tissue (allograft). 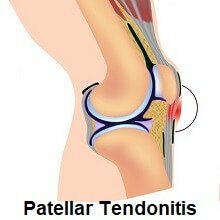 If using an autograft, the surgeon harvests some tissue from either your patellar tendon (below your kneecap) or you hamstrings tendon (on the back of your thigh). 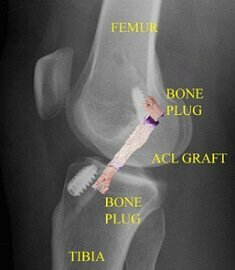 They use these to create a new graft which is fixed into place and to do the job of the ACL. Numbness around the scars is common due to damage to the small nerves around the knee from the incisions. It usually settles down after a few months, but occasionally it can persist long term. Numbness does not usually cause any functional problems. Sometimes the new ACL graft does not provide enough stability to allow return to full sporting activities. This is usually due to either the ligament not healing in a tight enough position or from associated damage inside the knee. Tailored rehab programmes and wearing an ACL brace can help with this. Stiffness is a common problem after ACL surgery, particularly extension (straightening the leg) but the chances of developing this are greatly reduced by starting exercises as soon as possible and strictly complying with the post-op rehab programme. Recent studies are suggesting an increased risk of developing arthritis later in life after ACL surgery. ACL injuries rarely occur in isolation, they are often accompanied by damage to the cartilage and other parts of the knee. However, it is important to remember that there is also an increased risk of developing arthritis after an ACL injury if you haven’t had surgery too. The most important factor in reducing the risk of developing arthritis is to regain full stability and strength at the knee, whether or not you have surgery. As you can see, these problems often stem from problems with the rehab programme, either from a poorly designed programme or poor patient compliance. It is really important to follow the advice of your surgeon and physio and to rigidly stick to your rehab and recovery programme. Recovery after ACL surgery is a slow process and it takes at least 6 months before you can start thinking about returning to sport. You can find out more about the recovery and rehab process after ACL surgery including a recovery timeline in the ACL recovery and rehab protocol sections.